A blank e-mail form appears. In the To field, enter a name. Alternatively, tap the Add Contact button to open the Contacts app and tap on a name there to add that person as an addressee. If you want to send a copy of the e-mail to somebody, tap the Options button to make those fields appear; then enter addresses or choose them from the Contacts app by tapping the Add Contact button. 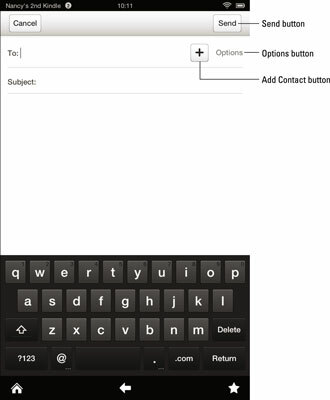 Tap in the Subject field and enter a subject by using the onscreen keyboard. Tap in the Message text field and enter a message. (Optional) If you want to add an attachment to an e-mail, tap the Attach button to the right of the Cc field and, in the menu that appears, choose to attach an item from the Photos app, OfficeSuite, or Personal Videos. To send your message, tap the Send button. If you decide you’re not ready to send the message quite yet, you also have the option of tapping the Cancel button and then tapping Save Draft. Here are a couple of handy shortcuts for entering text in your e-mail: The Auto Complete feature lists possible word matches as you type; tap one to complete a word. In addition, you can double-tap the spacebar to place a period and space at the end of a sentence. 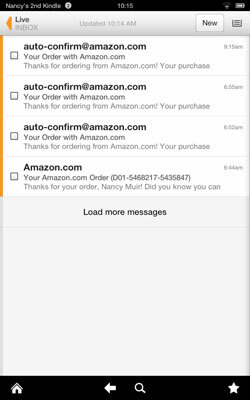 The Kindle Fire HD also can receive your e-mail messages whenever you’re connected to a Wi-Fi network. When an e-mail is delivered to your inbox, simply tap to open it. Read it and contemplate whether you want to save it or delete it (or forward or reply to it). If you don’t need to keep the message, you can delete it by tapping the Delete button at the top of the screen. If you’re expecting an e-mail but don’t see it in your inbox, try tapping the Menu button in the top-right corner of the screen and then tapping on Refresh. This pulls any new e-mails into your inbox.